Skype is setting up for their public IPO offering, and that means becoming as profitable as possible. As a result, this week they will start displaying ads in the Home tab of their desktop client. 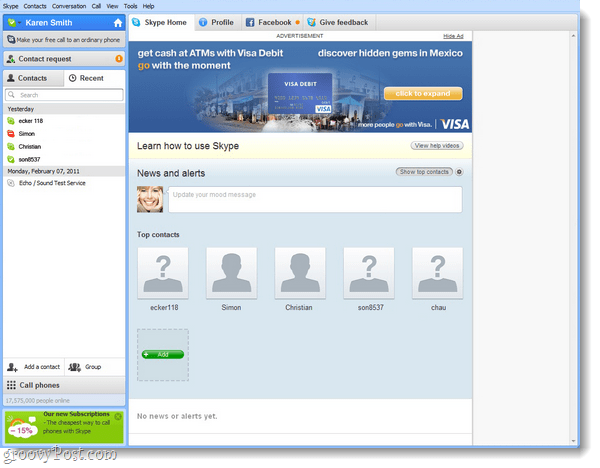 If you don’t use Skype for Windows, you won’t be seeing said ads, yet. Skype mentioned that they may be moving ads to their other platforms as well. In terms of usage, Skype has been growing at a steady pace since the start of 2010. In February their latest record was 29 million users simultaneously logged into the service, and they now boast 670+ million registered users. But, only ~9 million of those are regular paying customers. So, with a lot of what Skype offers they are giving away for free. The ads won’t interrupt your Skype experience. You won’t suddenly see annoying pop-up ads or flashy banner ads in middle of conversations. For the initial advertisement test run, they will only be shown in the United States, United Kingdom, and Germany. Though, expect to see them in other locations soon, assuming they work well.